About the Award: Elizabeth H. Hawkes embodied the life of VEP. In 1991, Betsy became a volunteer tutor. Until her death on April 24, 2008, she served VEP in many capacities. First and foremost, she was an outstanding tutor. She taught and mentored students from all over the world. We will forever remember this outstanding individual and share our appreciation annually with many others who selflessly share their time, talent, and passion to ensure success for our shared immigrant friends and neighbors. This annual award honors Betsy’s memory and service as a long time Board Member, Board President, Tutor and Philanthropist by recognizing an individual or individuals who best represent the Volunteer English Program’s core values, goals and overall mission. Shirley Warren, recipient of the 2018 Betsy Hawkes Memorial Award, with husband, Everett Warren and Bob Hawkes (right) in attendance. 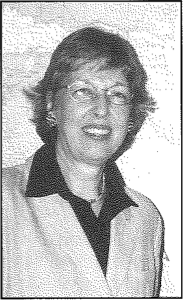 Shirley Warren’s involvement with and advocacy for Volunteer English Program (VEP) as a tutor and board member have supported English language literacy, community integration, and cultural empowerment for hundreds of immigrants and refugees from all over the world who have become our neighbors and fellow citizens. During her two terms as VEP Board President, she oversaw significant growth in its services and a transformative redirection from primarily state education funding to a diversified community-based funding model. 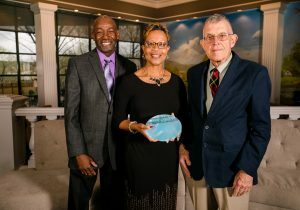 Shirley spearheaded the drive to diversify VEP’s revenue stream by partnering with other regional foundations, businesses and corporations and greatly expanded their fundraising efforts. Her guidance was critical in taking the organization from a “mom and pop” way of thinking to a stronger, more sustainable infrastructure-based business. She also made community outreach a hallmark of VEP, establishing events such as an annual breakfast fundraiser at Longwood Gardens and a 5K Fun Run. Through her corporate connection with IBM, she organized an all-day workshop that brought together students, tutors and local companies to focus on interviewing skills and resume writing, which resulted in a recurring grant from IBM for the charitable organization.